Athflow is a mobile application that efficiently communicates athletes' status to coaches and athletic trainers. Before I joined the team, the research lead Sam has already conducted primary and secondary research. I joined since "Data organization." I was the main contributor of ideation and implementation (which includes paper prototype testing, high-fi UI and high-fi prototype). Personal data tracking devices have been commonly used in team sports these days. Data collected during training or in games can be extremely valuable to coaches, athletic trainers, and other decision makers. To them, sport analytic models can be powerful to support the decision-making process through richer and more accurate input, and understand an athlete's potential (Sports Analytics: A Guide for Coaches, Managers, and Other Decision Makers, Benjamin Alamar). However, concerns and difficulties of using the data constrain the way data are used, especially under limited budget in universities. In the following, I build models based on data collected from the University of Washington. How might we solve these problems? Athflow records and shares athletes’ data among athletic trainers and coaches according to athletes' customization. 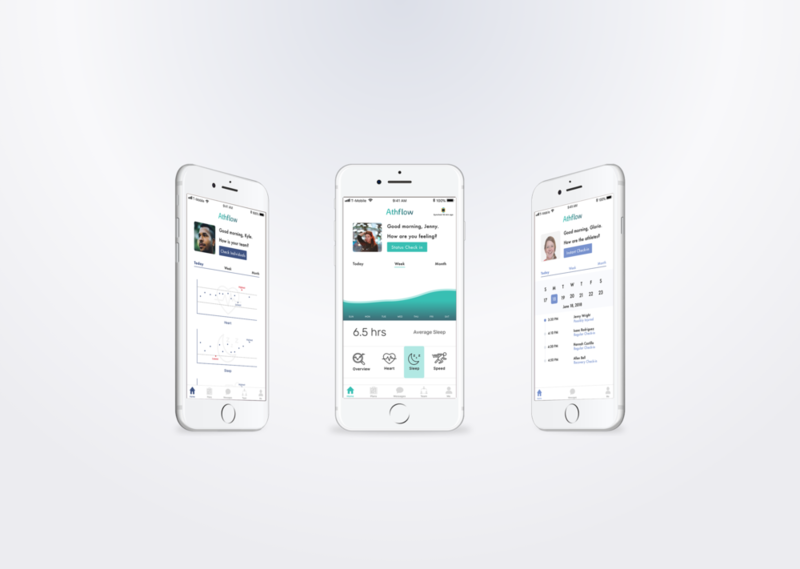 Athflow enables coaches to sync athletes' status instantly and adjusts training plan according to data collected from the wearable devices and athletic trainers. Provide customizability of different types of data's visibility. Athletes have the choice to select the roles they wish to see their wearable's data under different circumstances. Athletes can turn off the data they wish not to be seen under different modes. Visualize data collected from different devices daily, weekly, and monthly. Athletes can view the balance of their training and rest. Athletes can view the pattern of their performance over a period of time and understand their body better. When athlete needs to check in their status with athletic trainers, athletes provide their own QR codes for athletic trainers to scan. Digitally document every athlete's perceived symptoms and training suggestions on health cards. Athletic trainers document the symptoms they perceived during check-ins. Athletic trainers suggest recommended and unrecommended activities for coaches' reference. Athletic trainers enter dates to suggest effective time span of athlete's health status. Instantly sync every athlete's status. Coaches can see the data of the athletes who choose to be seen, represented as small dots on diagrams. Coaches can immediately see if athletic trainers' suggestions contradict with their training plans after athletic check-ins. In order to understand the problem space, we divided the target users at UW into two groups and conducted qualitative research. What are the roles of ATs and SPCs in preventing athlete injuries and enhancing individual and team performance? What wearable or other data do ATs and SPCs collect and how do they use it? What are the opportunities and challenges of using wearable data to prevent injury and enhance performance? What wearable or other data is tracked by athletes or their coaches and how do they use it? How does this data tracking affect student-athletes’ (or their teams’) training, performance, or recovery? What are athletes privacy concerns regarding the sharing of wearable or other tracking data? After all the interviews were transcribed from audio recordings, we used affinity diagram to organize emerging themes. #Theme 1: Data affects the athlete’s mindset. Positive data assures athletes’ they are doing work, while negative data impacts athletes’ attitudes significantly toward the practice. However, learning negative data does not help them improve their mental or physical status. Athletes trust their coaches and athletic trainers to have access to their performance and medical information, yet athletes might lie about how many hours they sleep, which would influence their training plans. #Theme 3: Athletic Trainers have a hard time getting coaches synced to each athlete’s status. Quantities of data on different platforms are difficult to digest everyday. Athletic trainers don’t have time to inform coaches on an individual level. Theme 4: Coaches found it impossible to verify every piece of information and adjust training plans accordingly. Coaches find it hard to distill useful and reliable information for their training plans. They can’t change the whole team’s plan because of some short notices. Facilitate communication between athletes, coaches, and athletic trainers. Consider athlete's privacy concerns while sharing personal data. Simplify the process of digesting data for athletic trainers and coaches. The logo I designed for the app. Based on the principles above, we ideated 30+ concepts. We then decided to go with a communication tool between athletes, athletic trainers, and coaches. 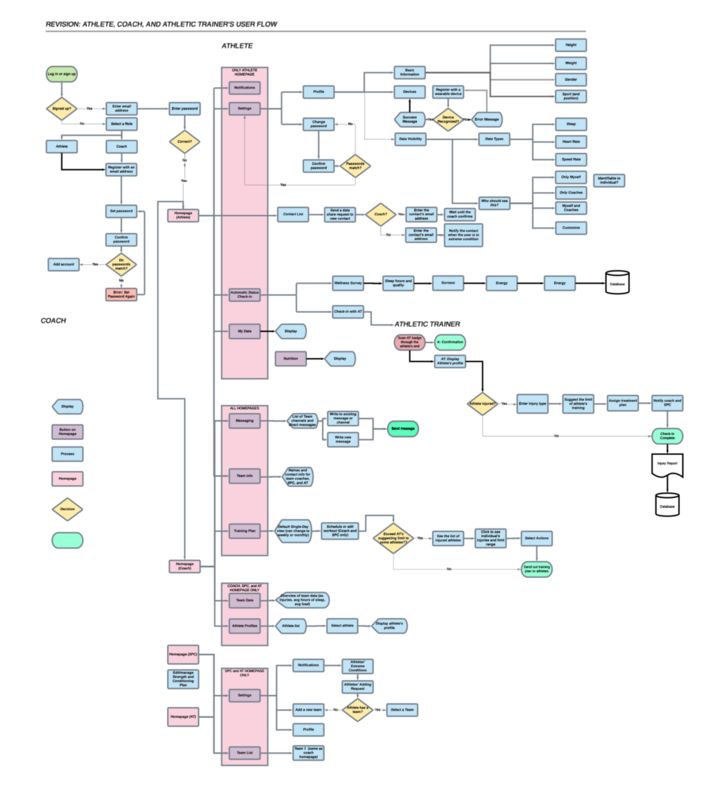 I drafted and revised the system map of the entire service. In this project I learn that before prototyping I must have a clear sense what this is for - is it for testing, demo, or presentation? There are so many flows I can prototype yet I only need to test the functions that I want to iterate on. In this project, I only had the chance to test the college athletes because the athletic trainers and coaches cannot make it. I should have contacted them one month before the testing so that I can accomodate my schedule to their schedule. Since this service design include 3 roles, we spent a lot of times on the system map that include a lot of flows that we cannot finish given the limited period of time. I should have defined the scope of the project earlier and decided the core features of the application.